Houston opens the season with three of its first four games vs. non-conference opponents, traveling to Oklahoma on Aug. 31 before its 2019 home opener vs. Prairie View A&M on Sept. 7. 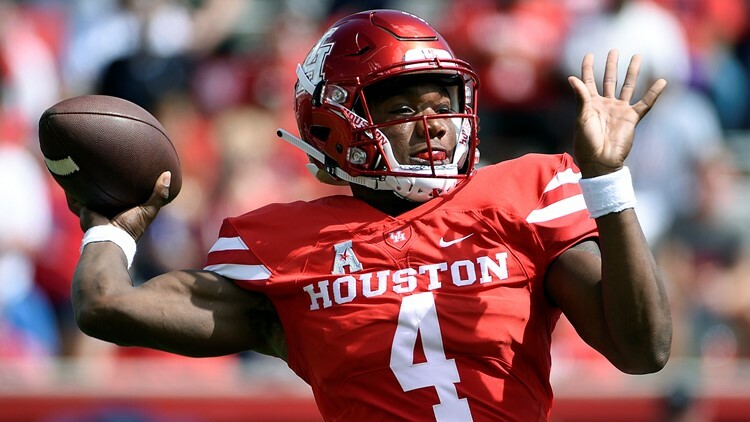 The 2019 Houston Cougars football schedule was released Thursday as The American Athletic Conference announced dates for its members' conference showdowns. Following the Advocare Texas Kickoff vs. Washington State at NRG Stadium on Sept. 13, which will air on an ESPN network, the Cougars open conference play in The American with a Thursday night showdown on ESPN at Tulane on Sept. 19. UH closes its non-conference schedule with a trip to North Texas on Sept. 28 before returning home vs. Cincinnati on Oct. 12. An Oct. 19 trip to UConn precedes a second Thursday night ESPN national broadcast, this time at home vs. SMU on Oct. 24. Houston opens November on the road, facing UCF on Nov. 2 before returning home for a week off prior to facing Memphis on Nov. 16. The final regular-season road trip will take place on Nov. 23 at Tulsa before Houston closes its regular-season home slate vs. Navy on Oct. 30. The American's fifth conference championship game is slated for Saturday, Dec. 7, and will pit the winner of the West Division against the winner of the East Division at the home site of the top division winner. Kickoff times for the first three weeks of the season are typically determined by mid-June. For games past the first three weeks of the season, kickoff times will be set by conference TV partners 12 days out, or in limited instances, six days out.